A mystery fever is stalking children in Bihar’s Muzaffarpur district. As many as 47 children succumbed to the disease by June 29. Seventy-nine others, admitted in the two government hospitals in the district, were either undergoing treatment or had been discharged after treatment. The disease has been around in Muzaffarpur and adjoining areas for a decade, but it is only now that the health authorities are making a serious effort to deal with it. All the patients suffered from inflammation in the brain, muscle stiffness and high fever that rendered them unconscious. “As the disease and the agent causing it remain unidentified, the children were given only symptomatic treatment,” says Braj Mohan, head of paediatrics department at Sri Krishna Medical College and hospital in Muzaffarpur. The disease that occurs in June and subsides during monsoon was for long thought to be Japanese encephalitis because the symptoms were the same. This was ruled out when Patna’s Rajendra Memorial Research Institute (RMRI) and Pune’s National Institute of Virology (NIV) ran tests on samples of cerebral spinal fluid and blood collected from the patients. “The samples tested negative not only for Japanese encephalitis, but also for Chandipura encephalitis and Nipah encephalitis viruses,” says Pradeep Das, director of RMRI. The institute forwarded the samples to NIV for further characterisation. But NIV made no headway and has now collected brain tissue and urine samples and rectal and throat swabs from the patients for further tests. A Union health ministry team that visited Muzaffarpur in the last week of June had termed the disease encephalitis. I P Choudhary, associate professor at the paediatrics department of Safdarjung Hospital in Delhi, reportedly said that “every symptom of the disease is matching with encephalitis; only the form is not known”. Details will be known after NIV releases its test reports. Earlier studies by NIV were limited in scope. Tests conducted by it during a couple of earlier outbreaks did not find viral cause for the disease. “Last year RMRI tested some samples of blood and cerebral spinal fluid. The tests were conducted only for Japanese encephalitis virus which was not found,” says S K Aman, deputy chief malaria officer with the Patna health department. That year, 21 children died of the fever. The data for previous years is not available. “We did not compile any data,” says A P Singh, civil surgeon, at the district hospital. Vipin M Vashishtha, paediatrician at the privately managed Mangla Hospital and Research Centre in Bijnor, Uttar Pradesh, says it is this narrow, non-serious attitude of the Muzaffarpur authorities that has resulted in high morbidity over the years. “We are missing the larger picture,” he says. Inflammation of the brain does not necessarily indicate viral affliction. It could be a stroke or toxin-mediated encephalitis. He cites an example from Saharanpur district. A similar mystery fever gripped the district for 15 years. The cases were treated as Japanese encephalitis until he identiied the real culprit in 2007—a toxin from Cassia occidentalis, a shrub common in the region. Vashishtha says the authorities should adopt a multidisciplinary approach to identify the cause of the disease. Tests should also be conducted for presence of bacteria and fungi, he adds. 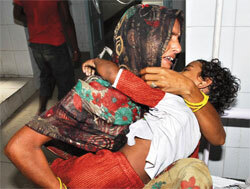 Bihar’s director-in-chief of health Surendra Prasad says the administration is committed to finding the cause. “Tests are being conducted and all 63 villages affected by the disease are being fumigated to kill vectors (mosquitoes),” he says. With the onset of monsoon, incidence of the disease has declined. It is feared that the problem may be put on the back burner, like it was done earlier, till the disease returns next summer.